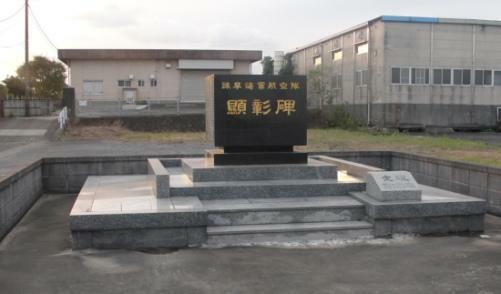 The front side of this cube-shaped monument has engraved the name of Isahaya Naval Air Group Monument. In March 1944, the airmen in Isahaya were designated as a detachment of the Omura Air Group. In March 1945, the Isahaya Air Group became independent from the Omura Air Group. This place was originally established in 1939 as an airfield connected with the Pilot Training School for the Ministry of Communications and Transportation. In the midst of the former World War, it was taken over by the Navy. Day and night the Navy carried out construction to greatly expand the airfield through the great sacrifice and devoted cooperation of local people. 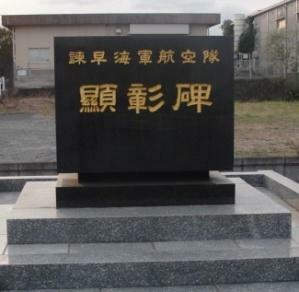 This is the site of the Isahaya Naval Air Group, which spent tumultuous days as it went from training pilots to having an important role by providing kamikaze  crewmen for the 5th Air Fleet. The Air Group also played an active part as an operational unit and protected our country in a time of crisis. With the end of the war, those wings disappeared. Now, as the years have passed, there is no longer anything left to remember the Air Group. We war comrades consulted together and erected a monument here through donations from comrades throughout the country. Filled with remembrance for those protectors who gave their lives with patriotic pure hearts and with prayers for eternal world peace, we desire to honor the great achievements of our predecessors so they will never be forgotten and to pass this on forever to future generations. The back of the monument has engraved the names of about 60 contributors and states that 350 other persons also made contributions for the monument's erection. The right-hand side of the monument lists the 13 members of the monument erection committee. 1. The Japanese word here is tokko, which means special attack. The Navy's Special Attack Corps that carried out suicide attacks against Allied ships was named Kamikaze.